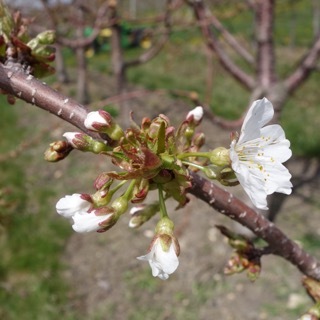 Note: for 2016, we have five Massachusetts orchard locations subscribed to AR: Belchertown, Easthampton, Deerfield, Groton, Phillipston, and Sutton. The website for looking at AgRadar for these locations is: http://extension.umaine.edu/ipm/ag-radar-apple-sites/. What follows is for the Belchertown location. Lesser Appleworm LAW -- 1st LAW flight begins around: May 10, Tuesday. Peak trap catch: May 21. Oriental Fruit Moth OFM -- 1st generation OFM flight starts: April 23, Saturday. 1st generation 55% egg hatch and first treatment date, if needed: May 29, Sunday. Spotted Tentiform Leafminer STLM -- 1st STLM flight, peak trap catch: May 6, Friday. Tarnished Plant Bug TPB -- Rough guess of when TPB begin showing on traps: April 17, Sunday. Rough guess of when TPB damage results in deformed fruit at harvest instead of aborted bud: April 20, Wednesday. • I think the thing on everyone's mind is the condition of apple flower buds. In Belchertown, we are seeing widespread injury (browning, crinkling) of spur leaves. That can't be good for the health of the flower buds and what developing fruit we may have. 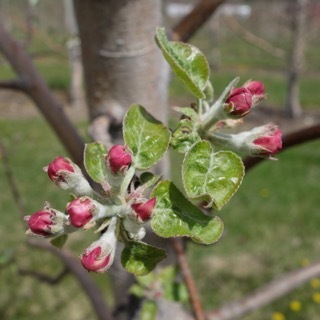 It's not too late (do it before bloom) to apply the 'spring tonic' foliar spray, see Prebloom Nutrient Applications for Apple Trees for details. There are big difference in varieties in terms of how the flower buds are developing and/or look. In general, McIntosh-type apples are OK, Macoun in particular looks good. Cortland less so. Gala are variable, as are many other varieties. 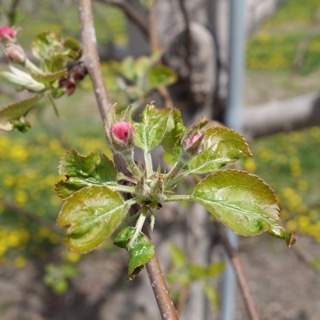 Honeycrisp really appear to have taken it on the chin, there are many, many buds that were there but just aren't developing. 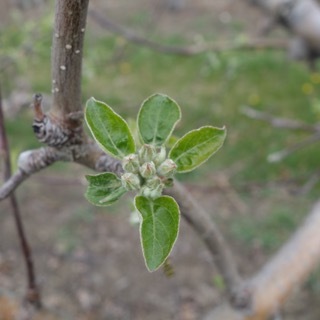 This is somewhat surprising, given the fact Honeycrisp buds were not as far advanced as others when we had the cold in early April. The king flower bud is frequently damaged across-the-board, so that is going to make thinning difficult. Sweet cherries are generally in tough shape (no bloom), however, tart cherries look pretty good. 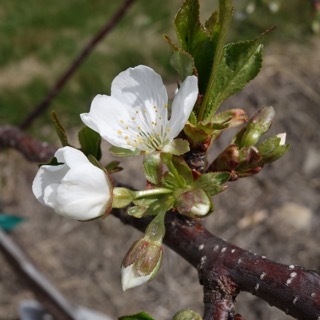 I have four test pluot trees that were in full bloom last week, go figure, although I hear plums are in better shape than all other stone fruit. What to look for as we go down the road? Mis-shapen/deformed flowers, missing flower parts (petals, stamens, pistil), damaged spur leaves. I'd also be watching for short flower stems and delayed emergence as the flowers separate, that could be an indicator of vascular/translocation (spur wood damage?) issues. All would be signs of trouble. 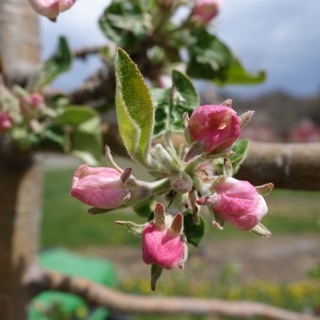 And of course we will need good pollination weather to set this apple crop. Let's keep our fingers crossed. • With the cooler weather, relax on the insect control front. Not much happening really. Pheromone traps for Oriental fruit moth should be up. Also pay attention to Upcoming Pest Events and AgRadar for what insects are currently active. 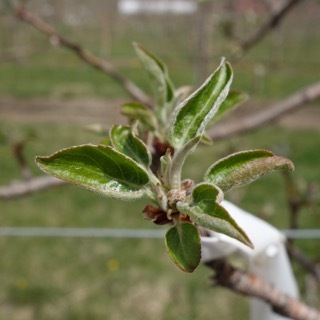 Whether they are of concern in your orchard is up to your insect pest history and monitoring. 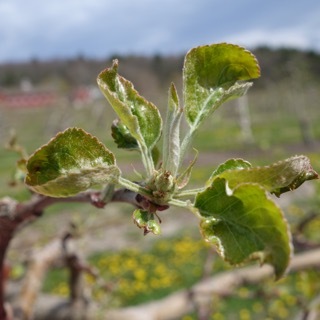 Following a relatively mild winter, the spring weather has inflicted varying amounts of damage on apple spurs. The extent of damage and the impact that this will have on the final crop load has yet to be determined. Return bloom is less this year in many blocks due to the heavy set last year. Therefore growth control may be an important component in block management this year. Apogee (BASF) and Kudos (Fine Americas) are the two prohexadione-calcium products available to control vegetative growth. Most are familiar with and have used one or both of these products. For the past few years we have recommended using a low dose of Apogee early in the season with the idea that it will reduce the impact that it may have on counteracting the efficacy of chemical thinners. It is well documented in the literature and through experience of many that Apogee can increase fruit set. 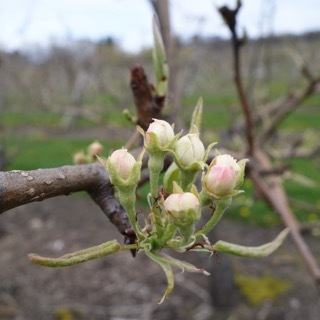 While in most years we generally hope to minimize increases in fruit set, this year we may want to take advantage of this particular characteristic of Apogee. 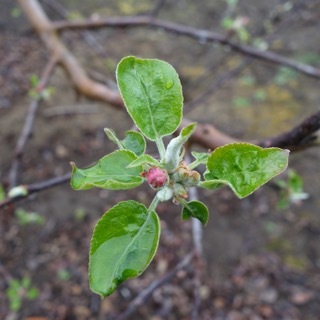 Last year I initiated a study using an early application of Apogee on Cortland apples at elevated rates (6 to 9 oz/100 gal) and some was applied at pink (when there is enough foliage to absorb the Apogee). The early application allowed growth retardation to start earlier in the season thus achieving a 20% more reduction in growth. In addition, the lateral shoot growth was reduced more than usual, resulting in somewhat weak shoots in the top of trees that were less likely to grow vigorously. I am suggesting that growers may want to consider trying an early application on at least one vigorous block to maximize growth retardation. One to two follow up applications will be necessary at 3 week intervals. 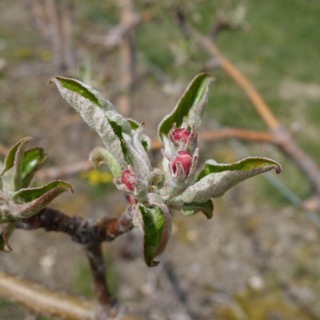 Many orchards will soon be progressing to the stage where some insecticidal protection is typically needed, so we would take this opportunity to point out the availability of a prediction tool that combines our historical records with the best biological projections we can offer, found on the NEWA Apple Insect Models website. We recently completed some further improvements to this web-based, "Real-Time" Apple IPM Decision Support System, which can deliver relevant, current information on weather data and pest populations to facilitate grower pest management decisions throughout the growing season. This system tracks seasonal development of fruit bud stage, key insect pests, and diseases using Degree Day and Infection Risk models. The models indicate pest status, pest management advice and sampling options, and are linked to an interactive system that helps growers choose appropriate materials when pesticide use is recommended. Insect pest developmental stages are calculated from Degree Day (DD) accumulations at IPM's NEWA and National Weather Service airport weather stations throughout the state, as well as a large number of sites in over a dozen other states, including MA, VT, NJ, CT, RI, PA, and DE. The insect pests addressed by this website are: apple maggot, oriental fruit moth, codling moth, plum curculio, obliquebanded leafroller, spotted tentiform leafminer, and (NOW also) San Jose scale. 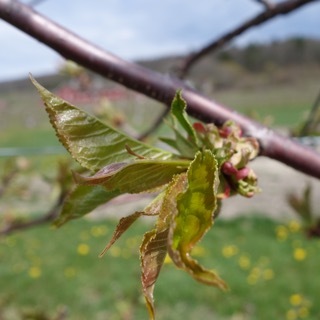 Disease predictions are available for apple scab and fire blight, and summer diseases (sooty blotch and flyspeck). Access to the Apple Insects (and Diseases) models is through the "Pest Forecasts" list or the "Apples" link on the NEWA homepage (http:// newa.cornell.edu). From the Apples homepage, clicking on the link that says "Apple Insect Phenology Models and IPM Forecasts" brings up a state map showing the available weather stations, plus pull-down menus on one side. The user selects a pest of interest, state, weather station, and the desired end date for weather data accumulation, and pest DD models and historical records are used to calculate: Tree Phenological Stage, Pest Stage(s), Pest Status, and Pest Management Information, all of which appears on a "Results" page. We have just finished updating the decision points for these advice categories by incorporating the most current 5 years' worth of temperature/degree day trends, which should result in more precise predictions. Additionally, the current DD accumulations provided on this page have now been linked to the newly reactivated NEWA Degree Day Calculator, so the results are given in the same format used by that tool: a table of the current accumulated heat units, plus the projected values according to NWS 5-day forecast data. A link gives the option of additionally viewing DD progress in graphic form. The phenological stage can be adjusted according to field observations by selecting from a pull-down menu; this will generally change some of text provided in the advice boxes. Links on this page can take the user to various other online resources, such as color photos of the bud development stages, NYS IPM Fact Sheets of the pests in question, and when appropriate, sampling charts for use in conducting field samples of specific pest life stages (e.g., eggs, larvae, mines). When a pesticide spray is recommended, a "Pesticide Information" link in the "Pest Management" box takes the user to the Pest Management Education Program's (PMEP) Tree Fruit IPM home page, where a pesticide decision filter helps users pick an appropriate material to use, based on anticipated pest severity and program type. A pesticide search returns a series of profiles of all the NY-registered products fitting the specified pest species and efficacy rating. The profile gives the common and trade names, labeled use rate, re-entry and pre-harvest intervals, and EPA registration number of each product. Also included are some general remarks on the range of product efficacy, and any known effects on beneficial species. A "Details" link in each profile box takes the user to a more extensive list of information, including notes on the active ingredient (including its mode of action classification), an overview of recommended use periods, and a link to a scanned copy of the NYS DEC-approved product label, which can be read or printed out. All of the information presented is already available online at various other Cornell fruit sites, but this website brings these resources together in one place that is more convenient and efficient to access. Predictions provided by the website can be refined and adjusted to reflect current insect activity by user-entered events obtained through field monitoring (such as pest biofix; i.e., the first sustained flight of a pest species). The pesticide selection filter uses Cornell University product efficacy ratings and the type of management program selected by the user (i.e., conventional, reduced- risk, non-organophosphate, organic). This website uses DD information based on either historical records or user-entered biofix data, and includes: the start, peak, or progress of the oviposition/egg hatch/crawler emergence period (for CM, OBLR, OFM, STLM and SJS); the start, peak or end of the pest's 1st, 2nd, etc., flight (for AM, CM, OBLR, OFM, STLM, and SJS); the first occurrence of adult or larval feeding, foliar or fruit damage, or mines (for OBLR and STLM). An improvement to the site we still plan to implement, in collaboration with a colleague at Penn State, is the incorporation of a least-cost product calculator function, to provide users with an estimate of how much they'll have to pay for a given pesticide choice. We are continuing our efforts to refine and improve the accuracy of the website's pest predictions, and expand the range of sites from which weather data is able to be collected. 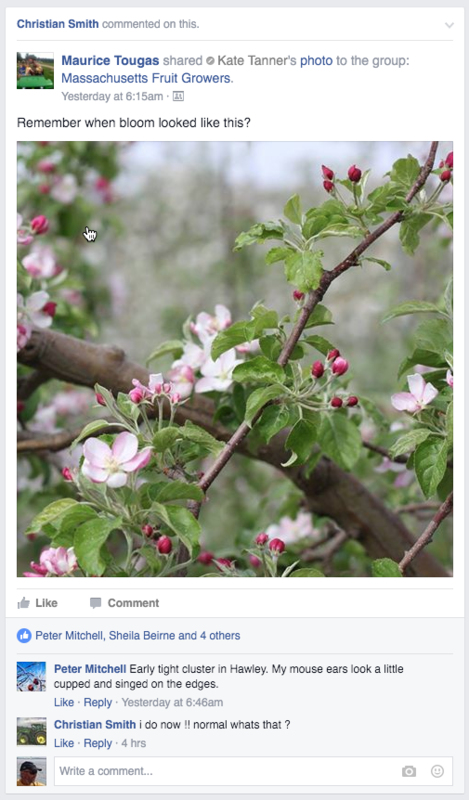 During this process, we encourage everyone in the apple industry to check this website for themselves throughout the growing season, to see how well it forecasts pest events in specific areas of the state. We appreciate hearing of any anomalies or irregular predictions generated by using the local data to chart pest or disease development in your growing area, and hope to end up with a pest management tool that is useful and accurate for advising apple growers about what's going on in their orchards in Real Time. The next Healthy Fruit will be published on Tuesday, May 3 (or thereabouts), 2016. As always feel free to get in touch with any member of the UMass Fruit Team (http://extension.umass.edu/fruitadvisor/team-members) if you have questions or comments.